This year the Westborough Community Land Trust (WCLT) was pleased to award two $1,000 scholarships and two honorable mentions to graduating Westborough High School seniors. Selections were made on the basis of essays submitted in WCLT’s annual Earth Day Essay Contest. 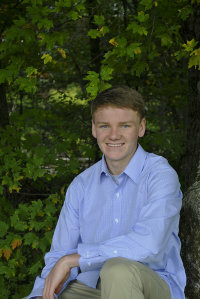 Benjamin Anderson won a scholarship for his essay describing his experience growing up around Lake Chauncy and his commitment to improve the environment and protect open spaces in his adult life. He plans to attend Worcester Polytechnic Institute. 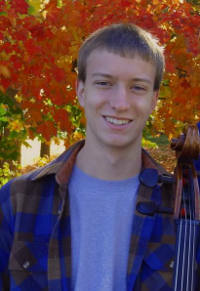 Owen Smallcomb received a scholarship for his essay about the environmental problem created by invasive honeysuckle species and by multiflora rose, a plan to increase public awareness, and his personal efforts to remove invasive species from local areas. Caroline Reynolds was recognized with an honorable mention for her essay describing her experiences running on Mill Pond’s trails and resting at its peninsula, and her involvement with the natural environment as a result. Nathan Adduci was recognized with an honorable mention for his essay describing the hazards created in the landscape by old barbed wire and creosote-cured fence posts, his work in removing these hazards from the Hidden Meadow area, and his suggestions for follow-up work. Lake Chauncy and the woodlands and fields surrounding it make up a very special place for me. I feel as though I grew up there rather than in my house. Since I was a child, there has hardly been a day when I have not either swum in the lake or hiked or biked in the woods around it. I have discovered special places and wildlife and these discoveries have made my life richer. I will have a lifelong love of the outdoors because of my connection to this place. In turn, I plan to do everything I can to improve the environment and protect our open spaces. When I was very young, my family and I would walk around the lake, but we would never take the same route twice. We loved to explore side trails. One day we discovered a large sand pit enclosed by a square wall of earth. We called it “the world’s biggest sand box” and went back many times to play in it. I learned years later that it was part of the abandoned septic system for the Westborough State Hospital! The sand was not placed there; it was brought by the glacier which once covered Westborough, and the sandy soil was the reason the hospital designers used that area as they did. Learning and discovery have always been part of my life as I have enjoyed the Lake Chauncy area. Since starting high school, I have roamed and explored farther, usually on my bike. One day as I biked on an unfamiliar path, I noticed that a wet area by the trail was draining, forming a brook right across the path. I wondered where the water was going, so I left my bike and followed it. I came upon a large river which I had never in my seventeen years realized flowed through my familiar woods! It was the Assabet River, I found out later. I was amazed that the woods were still giving me surprises. Something I never get tired of discovering is the variety of wildlife that makes its home in and around the lake. I have seen large water snakes sunning themselves on the rocks by the lake, and one time I found a tiny newborn water snake making its way across the path. Another day I must have arrived just after a nest of snapping turtle eggs had hatched, and I watched five baby snapping turtles march to their new lake home. I had seen adult snapping turtles and painted turtles before, but the babies were a much more exciting discovery. I enjoy wildlife of the warm-blooded kind as well. Once as I was riding my bike in the woods, I went around a curve and startled a deer that was standing in the path. I was surprised as well, to be so close to such a large and beautiful animal in the moment before it leapt away. I have seen beavers build a lodge at the edge of the lake. I have stood on crystal-clear ice in the winter, and watched muskrats swimming right below my feet into and out of their den among the roots of a maple tree at the edge of the lake. When I see things like that I feel the same excitement I have felt my whole life when nature shows me something new and wonderful. The fact that the lake and woods I love were protected by the state before I was born has allowed me the opportunity to have a lifetime of experiences there. In appreciation, I try to use the area wisely. I stay on the paths, especially when I am on my bike, I pick up litter whenever I see it, and I have cut or moved fallen branches off the trails and removed invasive plants. But protecting our environment is much more than that. I try to take short showers and minimize driving to protect the climate, and I recycle and compost. I will be off to college in the fall, and as I become an adult I expect to take my place among the next generation of stewards of the world’s natural places. I will join environmental organizations, vote for candidates who care about the environment, and maybe even find a way to use my career in computer science to better the environment. Because of my connection to Lake Chauncy and the other open spaces in Westborough, I am inspired to leave the world a better place. An environmental issue that is threatening Westborough's natural integrity is the spread of invasive species. Non-native plant species such as honeysuckle, multiflora, and glossy buckthorn damage the local ecosystem through rampant and unchecked growth. These invasive shrubs are choking out the native plant life, and are putting pressure on threatened and endangered species by dominating control over space and nutrients. One of the reasons these invasive species are so hard to control is a lack of public awareness. Most people are not aware of the dangers associated with these plants and the damage they cause. Because of this, locals grow a variety of invasive species in their gardens, starting new colonies and accelerating the spread of these plants. An example is Tatarica Honeysuckle, a shrub with beautiful pink and white flowers that is still available for planting despite the fact that it already smothers acres of local natural landscape. A solution to the problem of invasive plants is to increase public awareness. The best way to do this is to educate people on how to identify invasive species and to warn them about their negative effects. The first phase of my solution is to publish articles in the local newspaper. These articles would show pictures of nearby invasive species and would advise locals to avoid planting them. I believe this is important because many people don’t know what invasive species are and most cannot identify them, so they have no idea what to look out for when purchasing or growing plants. The second phase of my awareness plan is to place posters in highly used outdoor locations such as along the Charm Bracelet Trail, Veteran’s Park, and Lake Chauncy. Each poster will show a picture of invasive species that are common at that site, and will ask visitors to keep an eye out for those species. This part of my plan serves two important purposes. The first purpose is that it gives locals a chance to practice identifying invasive species so they can be more informed and so they know what the plants look like without needing any assistance from a picture. The second goal of the posters is to convince Westborough citizens that invasive species are truly a serious problem and that they are right in our backyard. When someone taking a walk on one of Westborough’s hiking trails is on the lookout for invasive species, they will be surprised by how common they are. I would hope that they would be able to see that in some areas, the only shrubs you can find are invasive. This is extremely important because it will push locals to take action against invasive species. Reading about them in the paper is easy to shrug off, but seeing the problem in person may actually cause people to become active in protecting the natural ecosystem. After people are aware of the invasive species’ presence in Westborough, the next step is to take action in controlling and removing them. One way that I personally have made this next step is through service projects in Boy Scout Troop 100. I have worked on several service projects that remove invasive species from areas around town including Lydia’s path, Walk Up, and Gilmore Pond. The most notable of these projects was my Eagle project, which was to remove honeysuckle and multiflora from a 100-yard stretch of hiking trails around Gilmore Pond. Beginning my project I was very surprised by the fact that every single plant in that location, other than trees, was one of these two invasive species. They had totally driven out all the other plant life that should naturally be there. For three weeks over the summer I led five work days where we used weed wrenches to remove all of the invasive plants. The before and after pictures of my project were truly stunning; a tangled mess of honeysuckle and multiflora became an empty space of dirt and trees, revealing the damage that the invasive species had caused. As someone who spends a lot of time outdoors and has had lots of personal experience with invasive species, I know how important it is for us to address the issue and protect our natural resources.